ESC Games is the creator of ESC Game Theater, a first-of-its-kind, high-tech venue where up to 30 people play wildly fun, casual games on a massive screen in a room pulsing with lights, special effects, music and energy. 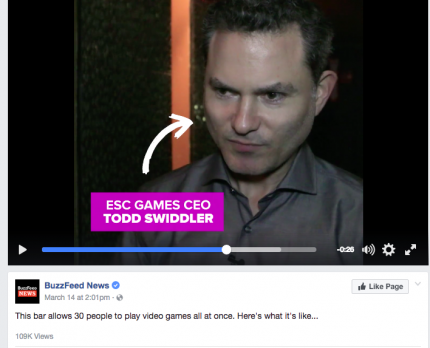 BuzzFeed visited the ESC Game Theater. Check out the segment that’s received over 109,000 views. PKPR organized a Happy Hour and Press Preview night to give New York City-based journalists a chance to experience the testing lab for the ESC Game Theater. Along with pizza and beer, 30 journalists and play testers played games like Robot Basketball and Pixel Prison Blues on ESC’s massive screen. Coverage included a Facebook Live segment by Mashable, video segments by PCMag’s Geek.com and Tom’s Guide, and stories by The Observer and New York Business Journal. ESC Game Theater on WNYW FOX New York from ESC Games on Vimeo. Fox 5’s Mac King came out tonight to the Garden State Plaza Mall to experience the nation’s first video gaming theater.